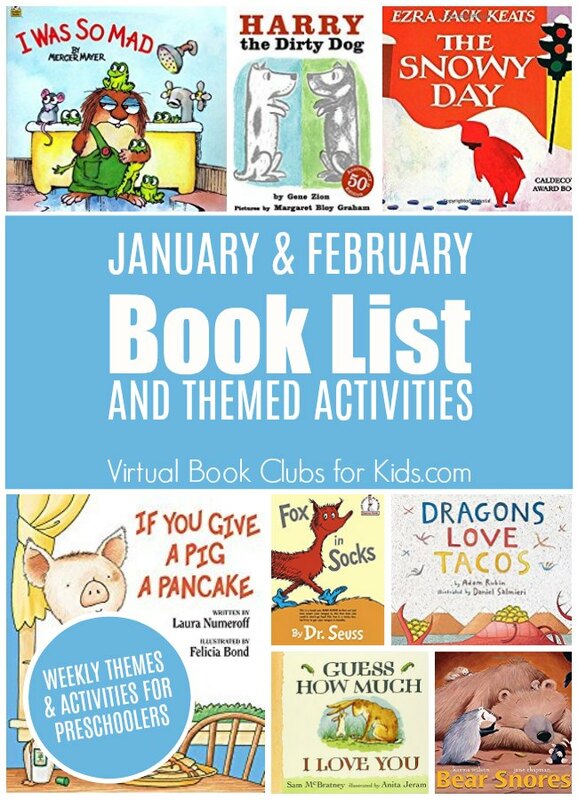 It’s time to announce our January and February Book List for the Weekly Virtual Book Club for Kids ! These books would make a perfect gift idea to add to your child’s bookcase of classic books they’ll read again and again. Join along this winter with these popular children’s books and themes for hours of fun and learning with your child. Here’s what we’re reading this Winter at #VBCforKids! I’m so excited to share with you the books we’re chosen to feature for our Weekly Virtual Book Club for Kids in January and February. Each of the books will have a FEATURED THEME and I’ll be sharing on Mondays my activities and activities from each of the Cohosts on our blog. Are you ready to join us in 2018? Here’s a more detailed look at the books we’ve chosen to feature in January and February. They are my favorite that I hope everyone finds to keep on their bookshelf at home or checks out from the library to read again and again. I’ve linked them up to Amazon.com for easy online shopping to build your children’s bookshelf! Many of the authors are popular authors too, we wanted to make sure to help you get exposed to series of books we love too! In the story, Bear Snores On, the Bear’s cave fills with animal friends as he sleeps. One by one, a whole host of different animals and birds find their way out of the winter’s cold and into Bear’s cave to warm up. But even after the tea has been brewed and the corn has been popped, Bear just snores on! The sweetest moment is when when he finally wakes up and finds his cave full of uninvited guests. It’s a fun story when you’re teaching your child about hibernation. captures the magic of the first snowfall as an adorable little boy shares his adventures in the city on a very snowy day. The story has become a favorite of millions, as it reveals a child’s wonder at a new world, and the hope of capturing and keeping that wonder forever. If you give a pig a pancake, she’ll want some syrup to go with it. You’ll give her some of your favorite maple syrup, and she’ll probably get all sticky, so she’ll want to take a bath. She’ll ask you for some bubbles. When you give her the bubbles.. Fans of “If You Give a Mouse a Cookie ” will love this perfect addition to the book series by Laura Numeroff as a little girl shares her struggles of own little pig. This funny picture book about the strong-willed dog who really doesn’t want a bath stands the test of time. Harry is a white dog with black spots who hates to take a bath. After a day of adventure, Harry gets so dirty that he no longer looks like a white dog with black spots. Now he looks like a black dog with white spots! One of our most favorite books of all time! When you love someone very, very much, you want to find a way of describing how much you treasure them. But, as Little Nutbrown Hare and Big Nutbrown Hare discover, love is not always an easy thing to measure! A treasured phrase you and your child will share at storytime “I love you to the moon and back”. Mercer Mayer’s Little Critter is having quite the grumpy day in this funny heartwarming book. Whether he’s cranky on the slide or stubborn in the sandbox, parents and kids can relate to this beloved story. A perfect book to teach children about their emotions! The classic Beginner Book features a tricky fox in socks and the progressively more difficult tongue-twisting games he plays on his exasperated friend Knox. This is a funny story all about dragons love tacos. They love chicken tacos, beef tacos, great big tacos, and teeny tiny tacos. So if you want to lure a bunch of dragons to your party, you should definitely serve tacos. Buckets and buckets of tacos. You’d better be careful though if a dragon accidentally eats spicy salsa! A SPECIAL PRESCHOOL BOOK CLUB GROUP JUST FOR YOU! To add some accountability and give you support in the new year, we have created a Weekly Virtual Book Club for Kids Facebook Group where you can come and get activity ideas, get additional book recommendations, and share what you’re up to with your kids! Do you think you can join us? Each week our VBC Cohosts will be sharing activity ideas for your preschoolers on their websites and in our facebook group. You can sign up to receive these activities in our Weekly Book Club Newsletter too! The activities will focus on the early childhood developmental skills needed for success in school. You can sign up for our BOOK NEWSLETTER to be sure you receive the latest book activities each week. Everything you need to help your child get ready for Kindergarten and foster a love for books and learning! Let me know in the comments below if you’re joining us! I can’t wait to experience this with you and your child and get to know you more. Those books are rather fun, and I am sure going to have my kid read few of these books; I hope he ends up liking them. I am so excited!! I have been looking for a blog like this and I’m so glad I finally found it. I didn’t want the typical pinterest worksheets but more hands on/playful learning based on books. This is so awesome. Thank you for providing this for free. I truly appreciate it.